The New, Lightweight, Compact, ADDvox XL Smart Hi-Tech 110v/240v Charger Will Charge Your NiMH Batteries in About 4-5 Hours. Designed to charge AA or AAA Nickel Metal Hydride (NiMH) or Ni-Cd rechargeable batteries. 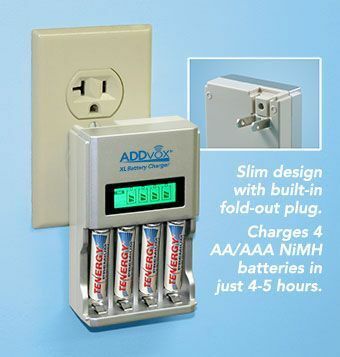 ﻿4 Independent Charging Channels individually charge one to four NiMH or Ni-Cd rechargeable batteries, with ﻿an Individual LCD Display for each charging bay. With handy built-in fold away power plug, slim-design and light weight (only ﻿3.5 oz), it's easy to take with you wherever you go. ADDvox NiMH AAA Batteries For Servox XL digital 1,000 mAh – For an additional 25% increase in your talk time! Package of 4 AAA Nickel Metal Hydride rechargeable batteries.